Catryn Power’s debut collection of short fiction is a love letter to her career in archaeology. We meet the ghost of a French nurse, a forensic anthropologist solving a decades-old murder, and an international gem smuggler. Join her characters as they escape attackers in an ancient crypt, relive the murder of an old Irish knight and uncover human remains in the trenches of World War One. Intrigue and forensics fuse in these ethereal tales of history and the supernatural. Power’s stories will captivate and surprise you. Catryn Power is a former Cork County Archaeologist who specialises in paleopathology and physical anthropology. She has worked on numerous excavations throughout Ireland and abroad and taught at both undergraduate and postgraduate level in University College Cork. She has written internationally on her projects for journals and magazines. In 2012, she was shortlisted by the Fish Short Story Prize for ‘The Officer’s Son’ and in 2013 her story ‘Thomas and Marigold’ was shortlisted for the Cinnamon Press Short Story Prize. Book Review – by Anthony Holten, Author. ​ Catryn Power Short Stories I met Catryn for the first time when she visited our Cork Stroke Support Group, at St. Finbar’s Hospital activity centre in Cork City last autumn. As a stroke survivor and fellow traveller on Robert Frost’s Road Less Taken, I was greatly impressed by her fortitude in overcoming the obstacles placed along this route. When reading her ‘Short Stories,’ I was even more taken with the writing style. Her graphic description of landscape, combine with the direct, no nonsense approach, such that one had the impression of travelling alongside the author – drawing the reader into the story, so to speak. These impressions were enhanced in the story entitled The Hairpin Bends, which evoked fond memories of my younger days, when we raced down the great ‘Sweep’ at Dungarvan in the annual road race named An Rás Tailteann. This book reflects the truth in the old adage that “one should write about what he/she knows best,” because Catryn Power makes the somewhat obscure science of archaeology really informative and interesting to the ‘ordinary’ reader. Engaging stories, written by a lady with a knowledgeable insight into the topic area. Enjoyable read. In this fascinating book of short stories the author glides seamlessly across the fields of archaeology where the past is certainly not past. In these stories even death is not the final frontier as historic medicine, ghosts, and forensics combine to finally, and peacefully, inter the bones of people who died long ago in mysterious circumstances. In No One Said Anything corruption and not murder take centre- stage. It is an insightful study of the human affliction of the flock mentality, where profiteering, bullying and corruption vie for dominance, but in the end ‘the wheel comes full circle,’ and returns us to a faith in humanity. It is a wonderful and most interesting book. A terrific read. Catryn keeps the reader enthralled in this collection of short stories. She applies her obvious talent for story-telling to engage us in a web of finely crafted tales of wonder, intrigue and adventure. Her piece-de-resistance, in my view, is the final masterful story. Congratulations, Catryn. 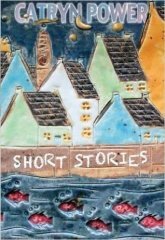 An excellent collection of short stories based on the author's work and experience. Dame Beryl Bainbridge would have seen this collection as perfect example of her aim in establishing the People's Book Prize. It is easy to read, Very well written. A good book for anyone who is starting or restarting to read. Its content is fascinating and contains ghostly events, uncovered human remains, intrigue, murder, politics and more. A great achievement for a first book. An engaging and imaginative set of short stories told with all the Irish eloquence that Catryn combines with her experiences and knowledge of the wonderfully colourful Irish people. Well done Catryn on a fine book. These stories are truly absorbing, Catryn takes the reader on a surprising journey to places you couldn't expect to find yourself. Very enjoyable read. Catryn is a lovely person and writes with a passion. Delightful mix of archaeological information and mystery/magic.Entirely plausible in an Ireland which still retains a sense of mystery and a feel for the other world. This book is a very enlightening read. It is an amazing compilation of archaeological incidents and imaginary ghost stories. It held my interest from the first page to the last sentence. It is so well written and can be picked up at any chapter. It is hard to put down once one gets engrossed in it. Really enjoyed reading the stories in this book and especially enjoyed the archaeological intrigues. Highly recommend the book to readers that enjoy history and mysteries! This is a fascinating collection of stories set in different times and places, each one unique in its approach to the telling of the story. Settings and characters become real and familiar to the reader, engaging our interest, weaving their way into our consciousness, involving us, moving us to care about happens. Catryn "does" the supernatural superbly, the first story in the collection, "The Hairpin Bends", was worthy of Hitchcock and quite unforgettable. The brooding air of menace, delicately hinted at, raises the stories from the ordinary to the extra special. Unputdownable. Catryn's mastery of language, her ability to paint a word picture, her enthusiasm and knowledge of her subject matter, make this a beautifully crafted book. Catryn Power is a natural writer,this book was so easy to read and the characters are wonderful. I really enjoyed it. I'm looking forward to reading more of Catryn's stories. Fantastic original work and for a great cause. Excellent read really enjoyed all the stories. A most entertaining read, highly recommended. A lovely read particularly for anyone with an interest in archaeology. Captivating read, her life experience and histories provide great material for her stories, well done. A quirky set of stories! Catryn's collection of stories reflect her vast knowledge of Irish history, and bring characters back to life with passion -- a passion for life she also possesses. How she manages to accomplish so much in her life has me in awe. Donating the proceeds to her Parkinson's support group is typical of her generous nature! And it makes the book even more special. Lovely interesting stores about ghostly archaeological tales that keeps the reader interested in east tale. Catryn Power's book of short stories fires the imagination by drawing on her experience as an archeologist. There's intrigue and a link with the past in every story which combined with Catryn's humour made this a very enjoyable and interesting read. Definitely a book to be relished and revisited! Very enjoyable read. Great to encourage new readers.